MacroMania: Does the Floor System Discourage Bank Lending? "Now, suppose that the Fed wants to achieve its target interest rate by paying 4% on reserves. The supply of reserves need not change. The yield on USTs need not change. Bank lending need not change. The only thing that changes is that the Fed now incurs an interest expense of 4% on reserves." "Need not change" begs the question, particularly w.r.t. bank lending, which is the matter in contention. Relative returns *have* changed, with reserves earning a higher average and marginal pecuniary return than before. 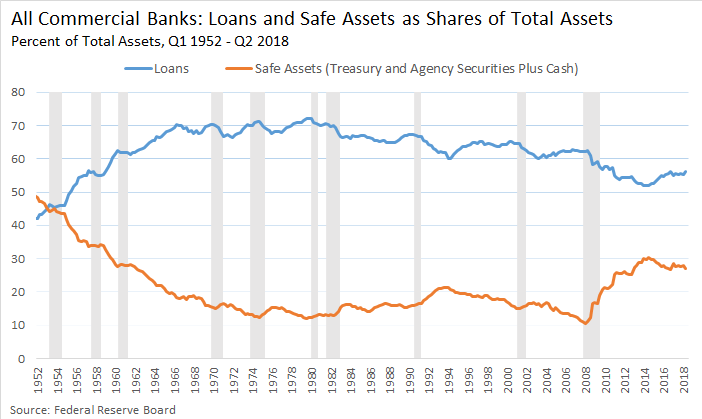 Banks will shift from other i-earning assets to reserves following this change until the marginal relative returns of reserves and alternative assets are once again equal: the original point of IOR/IOER, before the crisis, was after all to get banks to hold higher reserve ratios by reducing the opportunity cost of bank reserves. If demand for bank deposits is i-inelastic (or if there is little or no "pass through" from IOER to bank deposit rates, as has in fact been the case), banks' increased real demand for reserves must necessarily come at the expense of a reduced demand for other i-earning assets, including bank lending. Nor does the evidence contradict the claim that this is indeed what has happened. For decades, until October 2008, bank loans made up app. 100% of deposits, w/ only small deviations, while reserves where app. 0%. Today the figures are 80% and 20%, respectively. Thinking in terms of real rather than nominal values, that means a substantial change in the way in which bank-intermediated deposits are being invested: savings of bank depositors that once financed bank lending almost exclusively are now serving to a considerable extent to fund the Fed's balance sheet, that is, it's investment in long-run MBS and Treasury securities. As I sum it up in my book: "There Ain't No Such Thing As A Free Liquidity Lunch." I said bank lending "need not change" because in theory the effect of paying interest on reserves depends on whether the reserve requirement is initially binding. If it is, then paying interest on reserves lowers the cost of reserves and expands bank lending. If the reserve requirement is not binding, increasing IOR has the same effect as increasing FFR in corridor system. ...the original point of IOR/IOER, before the crisis, was after all to get banks to hold higher reserve ratios by reducing the opportunity cost of bank reserves. The original point of IOER was to have an alternative tool available to combat potential inflationary pressure without resorting to disruptive asset sales. I think we might both agree that the IOER rate at the time (25bp) was set too high (temporary NIRP may have been preferable). If demand for bank deposits is i-inelastic (or if there is little or no "pass through" from IOER to bank deposit rates, as has in fact been the case), banks' increased real demand for reserves must necessarily come at the expense of a reduced demand for other i-earning assets, including bank lending. I agree. But now replace IOER with FFR. Does the same logic not continue to hold? That is, wouldn't a higher FFR (3-month UST rate) make holding USTs more attractive for banks? What's the difference between interest-bearing reserves and interest-bearing USTs as far as banks are concerned? Nor does the evidence contradict the claim that this is indeed what has happened. For decades, until October 2008, bank loans made up app. 100% of deposits, w/ only small deviations, while reserves where app. 0%. Today the figures are 80% and 20%, respectively. According to Beckworth's Panel A (and my first figure above), bank loans never exceeded 70% of assets. Did you mean to say something else? "There Ain't No Such Thing As A Free Liquidity Lunch." -- Looking forward to reading that chapter! "If the reserve requirement is not binding, increasing IOR has the same effect as increasing FFR in corridor system." You here confuse two different things: the effect of an increase in IOER in an established floor system, and that of going to an IOER-based floor system from a corridor. In the first there is no change in the relative return on reserves. In the second there is such a change, and that is the case I have in mind, and the one that's relevant to assessing the consequences of the Fed's 2008 regime change. A corridor with FFR* = 2% and IOER = 0 (to let that represent the pre-IOER arrangement) is very different from a floor with IOER = FFR* = 2%, even though FFR* is the same in both arrangements. "The original point of IOER was to have an alternative tool available to combat potential inflationary pressure without resorting to disruptive asset sales." No: that was the purpose in October 2008. The *original* purpose to which I refer, which supplied the rationale for the 2006 legislation providing for IOER, was to encourage banks to eliminate the "reserve tax" and thereby get banks to keep higher reserve ratios; it was a Friedman-rule based argument. "According to Beckworth's Panel A (and my first figure above), bank loans never exceeded 70% of assets. Did you mean to say something else?" On the original (2006) motivation for paying interest on reserves, you are correct--the idea was to eliminate the "reserve tax." A corridor with FFR* = 2% and IOER = 0 (to let that represent the pre-IOER arrangement) is very different from a floor with IOER = FFR* = 2%, even though FFR* is the same in both arrangements. I agree with you, they are different. But how are they different? In the corridor with FFR* = 2% AND IOER = 0, banks are subject to the reserve tax. Raising the IOER to 2% eliminates that tax which, again, should serve to stimulate bank lending, not contract it. I believe the argument you want to make is that the market rate of interest plummeted during the crisis (let's say to 0% just to pick a number). At that time, the Fed started paying IOER of 25bp -- above the market rate (USTs were yielding below 25bp at the time). The policy mistake here is with respect to the choice of the target rate. The same mistake could have been made under a corridor system. Are we getting closer, or do I continue to miss your point? I don't think we quite agree yet, David, but we are indeed getting closer. It isn't just a matter of the right target-rate setting, though of course that matters. 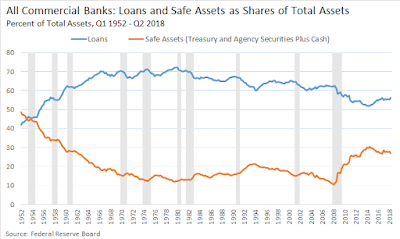 A transition from a corridor to a floor system necessarily involves a shift in bank preferences in favor of reserves at the expense of other assets, along with a potential decline in total real equilibrium bank lending. Suppose that the initial "corridor" policy rate setting was too high. In that case the switch to a floor w/ the same (excessively high) rate setting will tend to further undermine lending compared to the old set-up. Raising IOER has two potential consequences. One is a deposit-growth effect, which depends on (1) on the extent of IOER pass-through to deposit rates and (2) the interest-elasticity of demand for bank deposits. If both are high enough, increasing IOER may raise total bank deposits, and may thereby result in more bank lending. But empirical evidence suggests that (1) and (2) are in fact not very high. Indeed, there has been hardly any IOER-rate pass through to deposit rates, which by itself suffices to prevent IOER from having a deposit-growth effect. There is as well a second portfolio-substitution effect of IOER, and that involves banks' increasing the share of reserves in their asset portfolios in response to a higher relative return on reserves. This effect can make loans decline in response to increased IOER. And it can be very pronounced, and especially so if the IOER rate is substantially above rates on other assets. That can be the case even for low absolute values of IOER. Thus while IOER was just 25 bps, 1 year T-bills often yielded have of that return, if not less. Cash reserves dominated not only fed funds lending but lending on money markets generally. At the margin bank lending suffered as well, though that effect is less evident because average loan rates seemed so much higher than IOER. One must allow for marginal rather than average rates, non-interest expenses, and loan losses to realize that a bank loan at 7% might seem less lucrative than reserves yielding less than a tenth as much. But to get back to the main point, I think it necessary to distinguish the costs connected with a "wrong" policy rate setting in either a corridor or a floor system with those connected to switching from one sort of system to another. An excessively high policy rate is bad in any case. But a switch to a floor system from a corridor inevitably leads to a higher, if not extremely high, reserve ratios and associated changes to the allocation of real savings. Other things equal, and excessively high policy rate, when implemented using IOER, is likely to have a much more deleterious effect on bank lending than the same rate implemented in a corridor system. A transition from a corridor to a floor system necessarily involves a shift in bank preferences in favor of reserves at the expense of other assets, along with a potential decline in total real equilibrium bank lending. Well, I think statements like this are model-dependent. 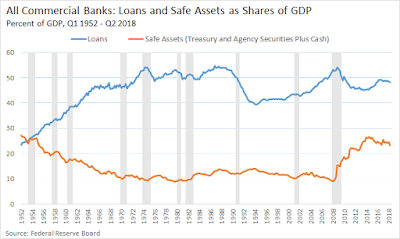 Banks will indeed favor reserves, but if it comes at the expense of equivalent-yielding USTs, I'm not sure why bank lending should be affected. Here is a model where Fed targets UST yield and pays IOR. If UST yield > IOR, then reserve requirement binds. Increase IOR to UST yield relaxes reserve requirement constraint and expands bank lending. I grant that this is but a simple model and the conclusions can vary depending on specification. But that's my point (hard to make general statements w/o knowing details). In any case, I think what you're saying is that for any given policy rate, floor system is tighter than corridor. If so, then just operate the floor a little lower than otherwise. With this adjustment, both operating systems can be used to conduct an equivalent interest rate policy. Yes? I should add, David, that I believe that in practice it is often likely to be far easier to set an optimal reserve tax in a corridor system, where IOER is generally < money market rates and Treasury yields, than in a floor system where it must be = or > those rates. Here I am speculating a bit. But as reserves are both of minimal duration and risk free, it's hard to see why they should not generally yield less rather than as much or more than other assets. Thanks, George -- I appreciate your comments and the discussion! You're welcome David! Your critical feedback is always very valuable. David, George this is a fascinating exchange to read. (1) Regarding Beckworth’s decision to use bank loans and safe assets in proportion to total bank assets (rather than GDP). I believe his approach applies in this case because the representative bank can control their loan-to-asset ratio much more than their loan-to-GDP ratio. Thus, to explain the extent to which IOER-market interest rate spreads affect bank asset allocation, it is necessary to use the loan-to-total asset ratio. (2) Indeed using a loans-to-GDP ratio would be a wash because I would imagine the argument would be that an above-market IOER suppresses the money multiplier (Bernanke’s explanation of how IOER works in his 2014, 8th edition macro text, p. 533), which in turn reduces aggregate demand as measured by (nominal) GDP. Thus, the Fed’s floor system reduced both loans and GDP, which would tend to make the loan-to-GDP ratio little changed. (3) David, regarding your point about IOR eliminating the reserve tax and encouraging more lending…it took me a moment to see your point, but I get it. (I.e., banks lend more which simultaneously increases demand deposits subject to reserve requirements, which are no longer taxed with IORR). It makes me think that differences in opinions expressed between you and George are arising from different assumptions about initial conditions. I’m curious to hear your thoughts on the following scenario, I’m not sure it will be illuminating, but I’ve found that trying to look at this from all the different angles can be helpful: Suppose the Fed set the IORR rate higher than the IOER rate, what would be the impact on inflation and employment? David points out that a lowering of the IOER lowers the cost of government debt. But it is not always the case that when deposits pile up that government really wants to go borrowing. Deposits may pile up because someone else, other than government wants to go borrowing. But it all equalizes, we say, we have a fluid market. The market is not as fluid as we believe, and the Fed is late to the ball game. Adjusting interest charges via the Treasury market requires big banks make the adjustments, a two step process to get loans where they belong. That is a recipe for cycles, we reach a point where the two step process cannot keep up and we have to reconfigure the banks. Hence the corridor, the idea being the two classes, depositors and borrowers are roughly in direct economic competition and the spread between deposits and loans is allowed to adjust, the two step process done in real time, one step. It all works through the loan to deposit competition which the Fed really should not interfere with except to make access reasonably fluid. The curre3ncy banker wants a representative sample of depositors facing a representative sample of borrowers, with everyone looking at the currency banker who is going to intervene with interest charges when the two groups get out of balance. In our system, the Treasury market intervenes, a three party system. Commercial rates are derived fro the Treasury curve, a two step process with an opaque derivatives industry intervening to get the job done. At the turning point, we don't have the elasticity, Tresury debt will pile up at the primary dealers, and they will take a few days to roud up investors, then report back to the debt advisory committee. This won't work when we get a change in terms of trade. In a true currency system, the currency bankers sees the change in terms of trade, along with depositors and borrowers, as it comes about; information flowing at the economies natural rate. The central bank method we use, the two step, is prone to loops in the yields adjustments. Who absorbs the loop cost? Treasury, but voters do not see the loop cost until terms of trade comes, then the insurance payments drive up Treasury debt. The loop cost is a gain to the limited number of wealthy investors who marginally make the market, they get advanced notice of volatility, by necessity, they cover the loop cost temporarily. Thanks David for bringing attention to my paper. George covers a lot of ground for me, but let add a few more points. First, you have noted before on this blog that the Fed has become a large financial intermediary since 2008. It is funding short-term and lending long. Where did this financial intermediation suddenly come from? Unless you want to argue the Fed created several trillions dollars of new financial intermediation out of thin air, then it must have displaced financial disintermediation somewhere else in the financial system. Given the source of its funding it is not that hard to guess where. Banks, in other words, have invested several trillion at the Fed rather than in the private sector for the past decade. Now during the crisis, one can explain some of this due to risk aversion. My argument is that the risk aversion can’t explain an entire decade of banks investing in the Fed. In fact, I provide empirical evidence that the share of bank loans and bank cash held over this period is tied to the IOER spread. And that is byproduct of the floor system. If you have another explanation for the regressions on the loans and cash I am all ears. Just to make this point clear check out this picture here. 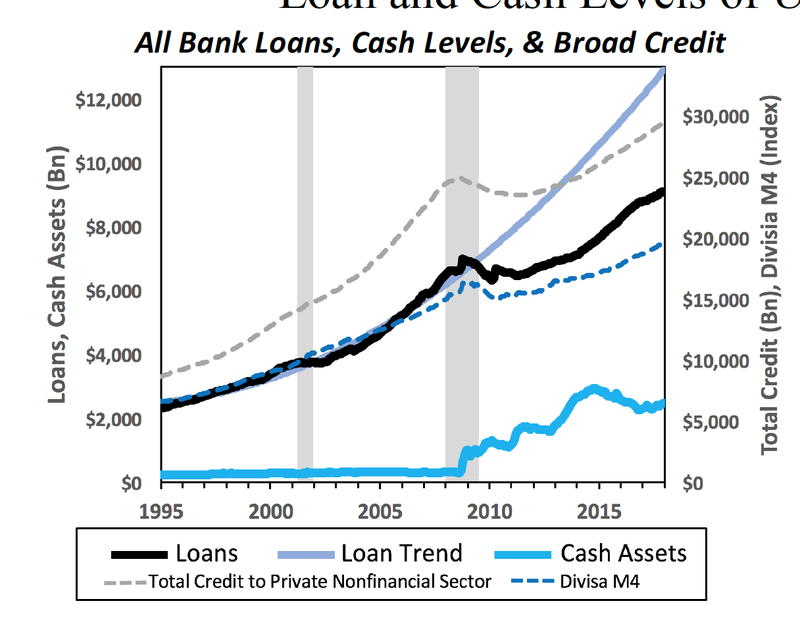 It shows bank loans in levels and it is well below its pre-crisis trend. Moreover, the difference between the trend and actual level is similar is absolute size the level of reserves. Further evidence that the banks have swapped loan assets for reserve assets. Second, I would remind you of the very point of floor system is to make bank demand for reserves to be perfectly elastic. That’s the textbook definition. Consequently, it implies that banks will take all reserves sent their way no matter what. So when you say “the complaint seems to be more with where the policy rate is set” the answer is yes, the rate is being set on perfectly elastic portion of the bank reserve demand curve. But again, this is intentional and part of what makes a floor system a floor system. How do you justify this claim in light of the evidence? There is no evidence that bank-financed private investment has been crowded out -- just look at my charts. 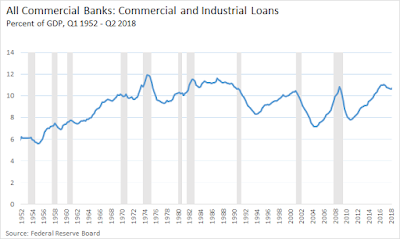 The OCC recently warned that bank commercial and industrial lending is at an all time high. 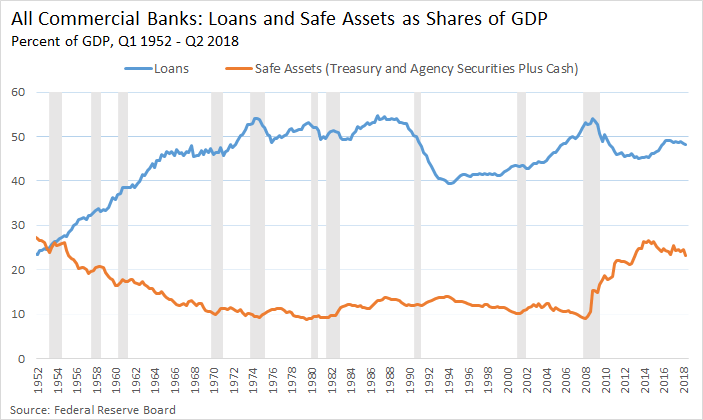 All that happened was that banks took more government debt on their balance sheets (mainly in the form of interest bearing reserves instead of treasuries). I provide empirical evidence that the share of bank loans and bank cash held over this period is tied to the IOER spread. Is your empirical evidence consistent with the fact that bank lending has not diminished? It's much higher than it was in the early 2000s, for example, when there was no IOER. How do you explain this? Just to make this point clear check out this picture here. 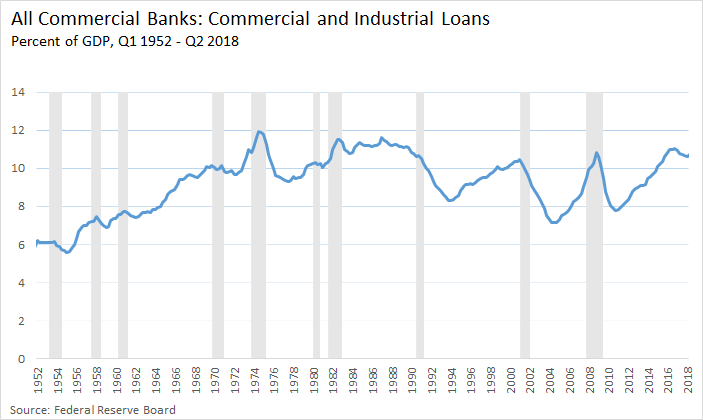 It shows bank loans in levels and it is well below its pre-crisis trend. The data I report above is consistent with what you show here. Your sample begins in 1995 though -- the end of the S&L crisis. My sample is longer and gives a clearer picture, I think. The trend you identify was just an S&L recovery dynamic. Yes, banks will readily swap USTs for reserves, I agree. Not sure why this has to affect their lending activity, the opportunity cost of which is determined by the policy rate (whether or not it is FFR or IOR). David, the chart I provide in the link above shows a clear break in the trend growth path of the dollar level of loans post-2008. You need to explain why this trend should suddenly change in 2008-2009 and never recover.s What is your story? I don't see that in your reply. In my view, some of it can be explained by regulatory arbitrage via fintech. Some of it can also be explained by increased risk aversion right after the crisis. But as I show in the paper, not all of it. A good portion is systematically related to the IOER spread. I don't think your charts are end-all of empirical evidence for this question. And they tell a mixed story. Finally, I ask again where did the Fed find the financial space for its large foray into financial intermediation? Was it an immaculate financial conception that Fed created? Did create financial intermediation not provided by markets over the past decade? Or has it crowded out some private sector financial activity? David, the chart I provide in the link above shows a clear break in the trend growth path of the dollar level of loans post-2008. You need to explain why this trend should suddenly change in 2008-2009 and never recovers. What is your story? I don't see that in your reply. Sorry, let me try to be clearer. The ratio of bank loans to GDP is near its historical average. This means that the "trend" you are picking up is not a trend -- it is mainly a reversion to the mean following the S&L crisis. I don't think your charts are end-all of empirical evidence for this question. And they tell a mixed story. I agree that the evidence seems mixed. I think this is the main point. My original claim is that you are conflating the effects of a floor system with the effects of a policy rate that may have been set too high. 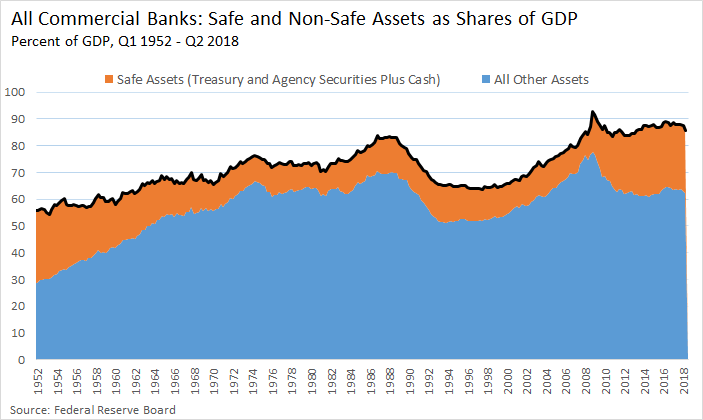 Would the crowding out you think you see have been any less had banks been compelled to load up on treasuries instead of interest-bearing reserves? I don't think so. So the question I'm asking is what makes interest-bearing reserves so special relative to interest-bearing treasuries as assets on banks' balance sheets? To answer this question, we need to construct a counterfactual. What if the Fed had not converted long-maturity USTs into interest-bearing reserves. Then where would those USTs have landed? And what effect would have had on bank lending and investment? Now that you have answered that, ask what difference it would have made if one relabeled those interest-bearing USTs as interest-bearing reserves instead? Now the private sector has to absorb reserves instead of treasuries. I am at a loss to understand how this relabeling of government debt is supposed to materially affect bank lending. Where the policy rate is set is, of course, a different matter. But that policy rate has nothing conceptually to do with which operating system we use (I think George may argue that, ceteris paribus, floor system implies tighter policy. But if so, then change the ceteris paribus, and just set the floor interest rate a bit lower. Again, the argument boils down to the policy rate setting and not the operating system per se). I hope this makes my view a little clearer!